» Today’s quiz: What sort of bug is this? Today’s quiz: What sort of bug is this? See that little green worm on the base of my left thumb? 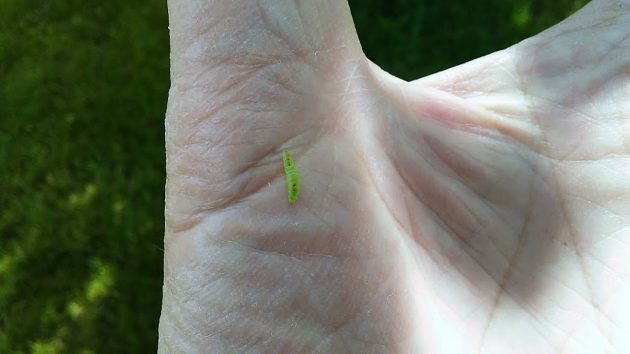 It was one of scores, maybe hundreds, of tiny caterpillars letting themselves down from trees in the yard this weekend at the end of strands of silk so thin they were hardly visible at all. It looked like a scene from an insect version of “Minority Report,” with tiny worm troopers descending on a hapless suspect — me. The suspect was puzzled. What are these things and why are they dangling from the foliage above? An entomologist would know, probably. And if you know, even if entomology is not your field, I’d appreciate a note in the comments below. A cursory search produced a couple of candidates from different websites. One described the oak leaftier caterpillar as “quite small, measuring only half an inch in length … greenish-yellow in color. These are frequently seen suspended from oak trees by silk threads.” This sounded right because a big oak was one of the trees overhead. H. H., they are a parasitic, constraining, skimming off of tax dollars, nasty, give-away $$$, parasite creatures known as CARA bugs. Destroy them immediately!! I will remember the name, CARA bugs. Thank you. Very clever and very apt. CARA bugs is funny. Well done there Engel. I laughed. Out. Loud! Must say though, CARA is putting money to work, right here, right now! Improving locally!! As opposed to those REPUBLICAN / 45 grifters at the FED level. Talk about giving it all away. Sigh! Thought sure I could find something on line to confirm my thought but team a ground. Same critters (I guess) here in northwest Corvallis, though just a few. I’d say more fluorescent green (like your photo) than greenish-yellow. catch a few in a jar and take them to Toms Garden Center or Garlands. It’s a good possibility they can tell you what they are. If that doesn’t work take them to the Couinty Agriculture Dept. As a last resort bike to Corvallis and take them to OSU. Call the masters Gardner desk in Linn county..(OSU EXTENTION office).. that’s what they do…. figure out bug and plant issues! The bug-in-Question has some similarity to the infamous Tent Caterpillar found in NE Minnesota. The creatures appear suddenly, literally in the millions. They devour deciduous greenery of any and all kind. Once a tree has been stripped of all leaves, the worms lower themselves to the ground on a silken thread. Because there are so many, the appearance is as though the stripped tree is tented by the many thousands upon thousands of caterpillars with their silken lines. The creatures are voracious and march mindlessly in search of edible plant material. They cross public roadways in such massive numbers, all the while being crushed by passing vehicles. I have even seen MNDOT close stretches of highway as they get too slippery from the juices flowing from the car-crushed bodies of these invasive worms. During really heavy infestations, I have seen entire trailer homes covered by the cold-blooded critters as they seek warmth overnight. The nasty crawling creatures will literally cover your front concrete porch steps as they seek warmth wherever they can find it. Eventually, after a couple of weeks, the Tent Caterpillar life cycle moves on and the worms spin up into millions upon millions of cocoons, eventually morphing into moths. The entire process is simultaneously intriguing and sickening, depending on how many Tent Caterpillars are “parachuting” out of the trees, landing in your hair, in your ears and other orifices. Oregonians had best hope these bugs Hering found are not related to the Tent Caterpillar (aka-Army Worms). The invasive experience is not for the weak of heart.